The Pew Research Center’s Internet & American Life Project reported last month that the number of people research and purchasing goods online continued to rise. In 2010, 58% of adults reported they conducted product or service research online , compared with 49% in 2004. From 2000, Americans purchasing products rose from 36% to 52% today. While it’s not a one-to-one correlation, it would seem that most of the people researching end up buying online as well. Probably the big news was that 24% of Americans said that they posted comments or reviews online about the product or services they buy. That’s almost half of the people who do buy online. It seems like there’s a lot of room to get this talkative audience to share more. I’m actually surprised that the numbers aren’t higher, at least for researching and buying. Basically, a little more than half of Americans are online searchers and researchers. Half. Why aren’t more people in the e-commerce habit? From what you read in the media today, it sounds like everyone is there. The same report said that those in higher income and education brackets do more product research than those in lower income and education brackets. So the digital divide is bringing that number down. You have to guess that if people can’t afford a computer at home, then they’ll do their research at work. Unless, of course, companies and organizations they work for have restrictive Internet policies, which many do. It seems that, for the good of all e-commerce, that workers should have the right to a certain amount of time, while at work, to conduct personal business on the Internet. Just like they probably do, when it comes to talking on the telephone. Two technologies you can use for personal and business reasons. I wonder too if this also shows a digital divide between the stores people shop at and their online capabilities. Maybe there are still a group of businesses whose Web sites and e-commerce capabilities are close to non-existent, so there’s no real reason to do any research online in the first place. If the challenge is an income issue, then we, parents, taxpayers and policy makers, need to do a better job of educating people, in schools, at work centers, and at work, on how to use the Internet. If these numbers hold out, our economy may depend on it. We talk a lot about the importance of connecting social media to customer service or to other real people working at a company. But in reading a report out from Paco Underhill's Envirosell it's clear that connecting needs to pertain to more than just social media. The latest report on holiday shopping in NYC in 2009 showed that 88% of people visiting a store also visited that store's Web site. 75% said going on line helped them shop at the store while 26% said that they'd visit the site to continue shopping after leaving the store! From a customer perspective, it seems pretty clear that they view the offline store and the online store as pretty much the same thing. The former you have to travel to, meet people and feel the actual goods, the latter you can do from anywhere at anytime on your own. Other than that the difference is fairly minimal. The scary part is that these two completely different company units usually run these two areas. The challenge for brands is to connect the two of these and to offer similar services at each. On the Web side, we've seen an increase in ways to connect with real people, via chat or click to call. On the retail side, the connections are harder to find (and no, I'm not going to talk about Nordstrom again). One great way to connect the offline to online is to make sure those front line sales staff feed back the questions they get to the Web team and customer service. That way the site can anticipate those questions. On the flip side, make sure your site deals with all of those post-purchase questions like returns (even if you didn't buy online) or figures out a way for the sales staff to provide continued value to shoppers through the site or email. It's pretty clear from Envirosell's report that brands can ignore connecting the online and offline shopping experience at their own peril, since 44% of in store shoppers end up visiting a competitor's Web site. Connect everything. It's worth breaking through the resistance. Online retail continues to grow while local communities struggle with deep economic problems. Do these two economic trajectories have anything to do with one other? While there may not be a causal link between the two trends, it's time for online-only retailers to do the right thing: Charge and pay local sales tax. Put very simply, the convoluted online tax system works like this: If a retailer maintains physical commercial space in a state, people who buy from its online domain are required to pay sales tax on their purchases. This is why individuals pay sales tax when shopping online from websites like Walmart or Costco. If an online retailer does not maintain a physical presence, it does not charge and don't pay sales tax. This is why individuals don't pay sales tax when you purchasing on websites like Amazon or MacMall. In the current system, local communities subsidize online-only retailers at the expense of bricks and mortar stores - you know, the retailers that provide jobs to the people in your community. Even more distressing, these subsidies come from local tax coffers. It's time to change the system: All online retailers must be made to pay and charge a sales tax to help local communities. The choice is ours, really, as consumers. What do we support more? Roads, schools and police in our cities and towns? Or 4-6% off our consumer purchases? We may think that we're saving by embracing the rapidly growing realm of e-commerce, but in reality, we end up paying in an unacknowledged capacity - either through property taxes or increased sales tax, which hits our local retailers even harder. According to Mercent, Black Friday online sales for 2009 grew by 41% since 2008. That does not even include so-called Black Monday. Washington Post's David Ignatius perceives the Californiazation of America, where local government don't have the will to balance spending with tax revenue, as inviting another looming financial meltdown. Seth Godin shows succinctly how online retailers have already changed the nature of the record and bookstores. Online commerce has won here and is winning in other areas as well. Online retailers don't need our help and don't need to be subsidized. They already offer more choice, greater convenience and more competitive pricing than brick and mortar stores. Our communities need our help. The question is whether lawmakers have the guts to legislate this much-needed change. I doubt they do. Maybe concerned local citizens should band together and publicly target and shame the sites that don't support their communities through local sales tax. The difference between one online retailer and another is pretty slim. If the choice is between supporting my local police force and supporting some unknown corporate wonk, the choice is easy, if somewhat blunt. And if you really don't want to pay sales tax, there's always New Hampshire, where you can basically live free or die. 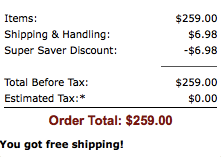 Come on, online retailers. It's time to do the right thing. Pay up. Actually, I've changed my mind. Here's why. 09/10/2009 Toilet Paper Online? Go Ask Alice.com. I think she'll know. The best thing I've seen on social media in a while happened this last week when 1-800-Flowers revolutionized its Facebook pages with e-commerce. Remember when the hot thing on Facebook was sending virtual flowers, beer and ice cream? Business sprouted up to take advantage of this new Fad. 1-800-Flowers has instead turned the virtual real. It's trying to realize the true promise of social media by letting people do anything from their comfortable social media homes. Isn't that the true promise of what everyone's attempting to do? Find where your customer are and go there, instead of inviting them to go somewhere else? I think this is a game changer. What do you think? Toilet Paper Online? Go Ask Alice.com. I think she'll know.